In the village area, lure the boar all the way through the level to the room across the thorn bridge, into the spider falling room. Have it eat the mushroom in that room, and the Pickaxe will appear. In NG+ giant Boars appear in the royal camp, and The Duke's Dear Freja may appear on the cliff just before the first cavern. In NG+ and upwards, when you are in the narrow corridor after the first cliff with the boulders, and preceded by an earthquake, The Duke's Dear Freja will appear. Any damage you deal to her at this stage will carry on to the "real" boss fight later on. The 20x Heavy Bolt trap chest is replaced by 20x Magic Bol on NG+. 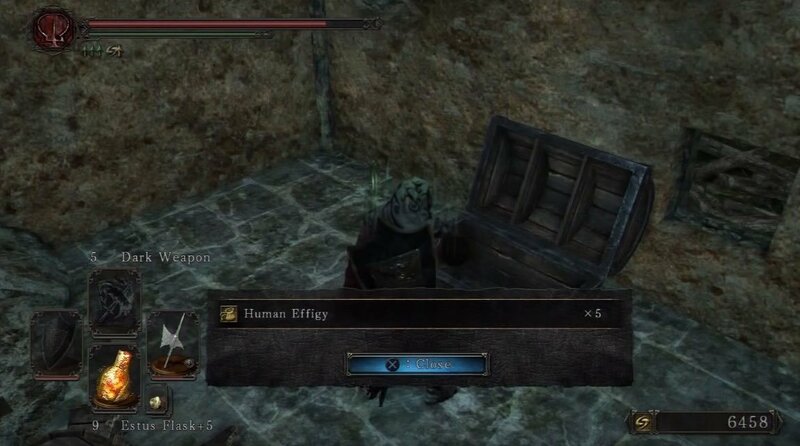 In NG+, in the illusionary wall in the same house, you will still be able to obtain the same loot as in NG, however you will have to fight a Dark Spirit to do so. After having entered the area from the Doors of Pharros, continue forward past the break in the short wall, and enter the first tent on the right. Here is the first Bonfire of the area. In this area are several Hollow Peasants, and larger versions of the Undead Devourers (Pigs) that you might remember from Majula. While they may not appear to be too much of a threat, the Hollow Peasants have Dark-enchanted weapons, which make them swing pretty hard! Beware of the other tents, as some hide Hollow Peasants. 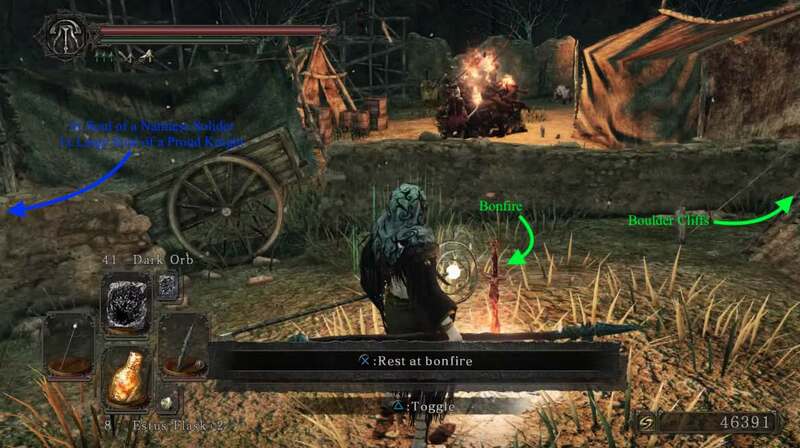 From the Bonfire, head into the tent on the left of the burning corpse pile to find a summon sign for Benhart of Jugo. Continue to the left and dispatch the first of many Hollow Peasants, standing by 4 corpses with a total loot of: 3x Soul Of a Nameless Soldier, 1x Large Soul Of a Proud Knight. Once you have, attack the scaffolding with a corpse on it to drop the loot and grab the 15x Lacerating Arrows. Look for the ruined building and break the urns beside it to reveal a corpse holding a Large Soul Of a Nameless Soldier. The doorway of this building is blocked off so we're heading to the well on the right, instead. 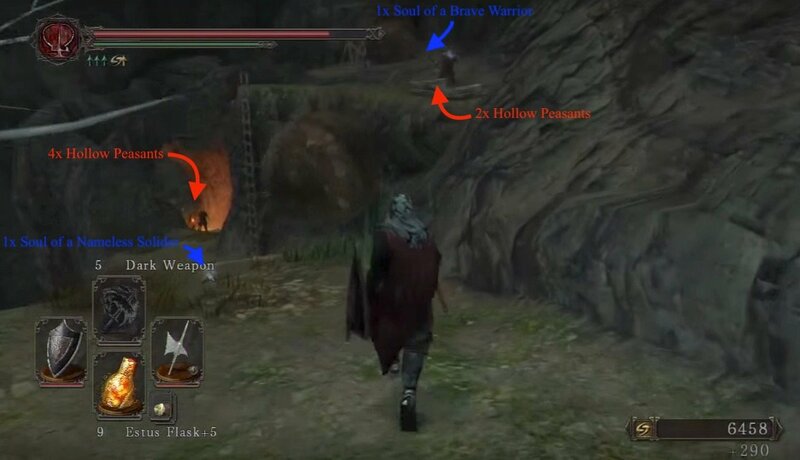 Loot the corpse hanging over the well for a Titanite Shard, then head up the ramp to run off it, and down the well. At the bottom of the well is a corpse holding 3x Holy Water Urn. Continue on and up the ladder to enter the building with the entrance that was blocked by rubble. Inside is a chest containing 5x Human Effigy. Climb up the rubble to exit the house. From here, head back to the bonfire and to the right of it this time, to arrive at the cliff edge. Follow the path down until you see a ladder. BEWARE as there is a trap that sets a huge rolling boulder down the platform above, and if it connects, will knock you down to your death. Make a beeline for the ladder, picking up the Soul Of a Nameless Soldier before you rush up. There's a total of two Peasants and two boulder traps -one has almost definitely been set off, so set the other off by breaking its wooden support, to collect a Soul Of a Brave Warrior. Head back down and continue along the path ahead, where you will face another four Hollow Peasants. 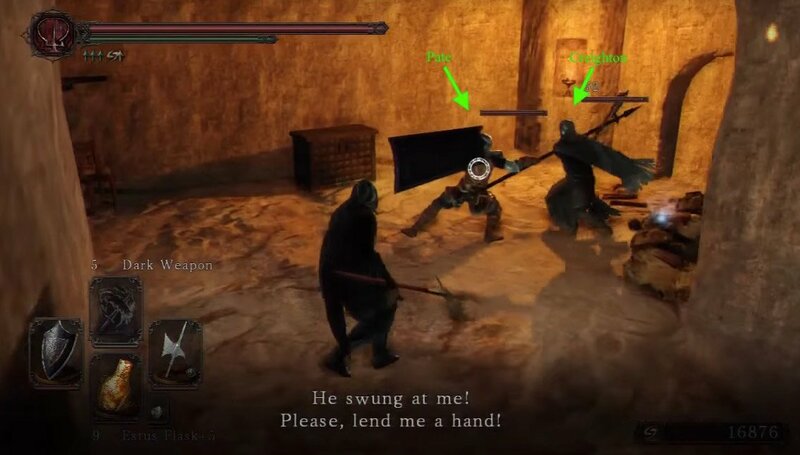 Hanging off the ledge on the right, is a corpse holding Large Titanite Shard. Continue on to find more Peasants guarding a large door. Once inside, head down past the first large room and into the second, which has multiple Ducal Spiders lying in wait, to ambush you. Kill them using a mix of range and melee attacks, then loot the Trap Chest for 20x Heavy Bolt. Continue through the iron door ahead to reach a room with a Boss Fog Gate. Breaking the urns here will grant you a Human Effigy. Before jumping in to progress, head straight from the door you just entered, to find an Illusory Wall -press the "use" button on your respective console to uncover it. Head up the stairs and down the hall to find a Water Urn and a corpse holding Priestess Set. Head back to the Boss Fog. 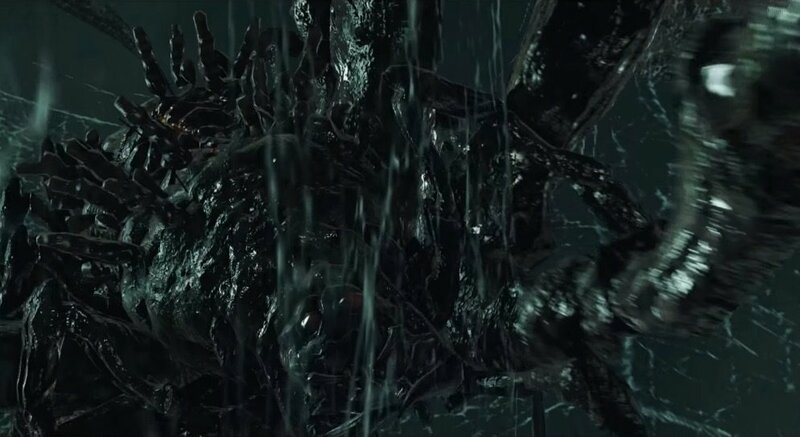 Killing this boss nets you a nifty 7,000 souls and a Titanite Slab. Go through the door ahead and face immediately left to find a ladder in the alcove of the wall. 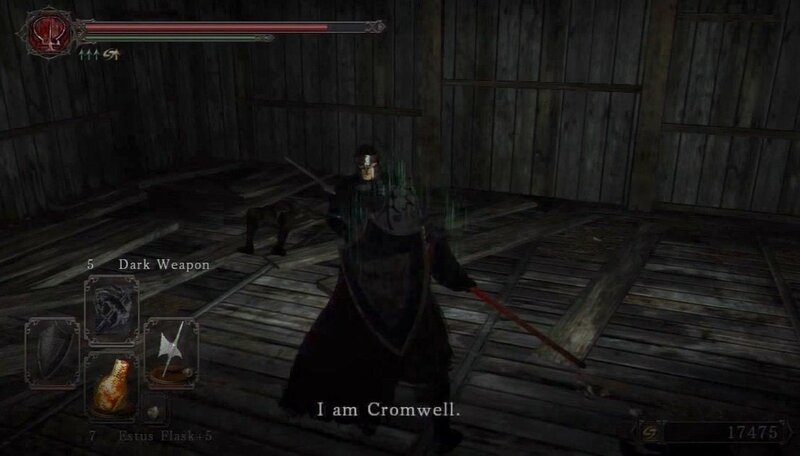 Head up to reach NPC Cromwell The Pardoner and multiple corpses to plunder a total of 1x Bonfire Ascetic, 1x Cleric's Small Shield, 3x Fading Soul, and 1x Skeptic's Spice. Speaking to him, if your Faith is above 35, will grant you a Ring of Resistance. When you are ready, head back down the ladder. If you can do high range damage, you can move towards the cliff edge and try to snipe Crystal Lizard on the ledge below, but do not jump down to grab the loot, as you will be there very soon anyway. Head back to the boss door but this time enter the cave via the entrance on the right. Turn left before the ladder to access the Bonfire. Head down and look under the stairs to find Ducal Spider, and a corpse holding a Soul Of A Proud Knight. There will also be another passive Ducal Spider on the wall; this could possibly be an indicator of things to come. The room through the doorway, holds some urns containing 2x Wilted Dusk Herb, but most importantly, an ambush of Spiders as soon as you enter. 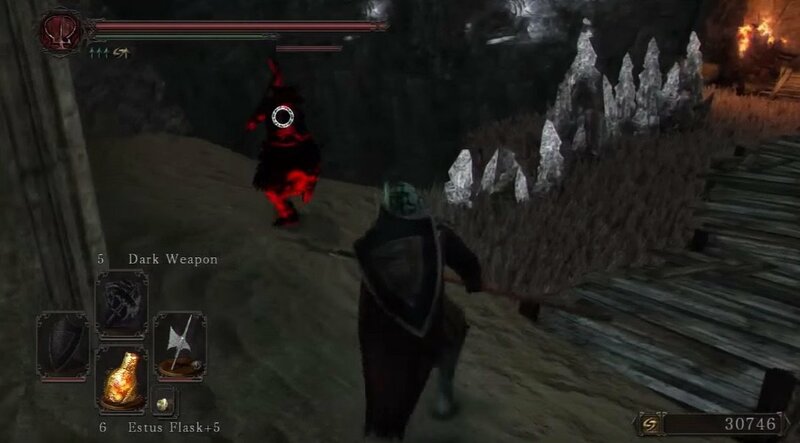 Move forward to a Hollow Mage facing away from you, on the ledge, a very easy backstab target. Loot the dead NPC and talk to the living NPC after the battle, exhausting their dialogue to receive the Tseldora Den Key. If you sided with Creighton, you'll also receive his armor set. Unless you've already collected his set from Earthen Peak, killing Pate will also grant you his armor set. While it may feel scummy, it is generally a good idea to also kill whoever you sided with, because (as you probably already know) they are both scumbags and wish you death. Break the jars in this room to reveal a corpse holding 3x Charcoal Pine Resin. Head into the far left corner of the room, into the hole in the wall. Go through the first door and to find a corpse holding a Torch, on the right. 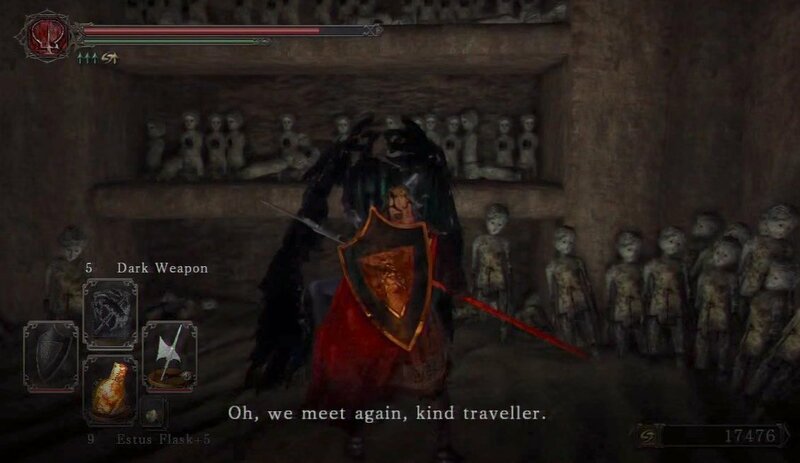 Past the second door is another Crystal Lizard, killing it yields 2x Titanite Chunk and a Twinkling Titanite, and to its right, a corpse holding a Titanite Chunk. On the left side of the ledge, kill the Spider Drone sitting there and cross the wooden bridge. In the room to your left are three more Spider Drones and a door which leads to a small path to the right that has a White Hollow Mage Robe (note that this is only available if the Hollow Mage you killed dropped it), and leads back up above to the wooden bridge. Smash the random objects located to the left to reveal a lever which will lower a platform above. To reach it, head back up the small stairs and make a carefully aimed jump towards it. In the chest here, is a Southern Ritual Band +1. From here the best things to do next is to simply Homeward Bone and head back across the zip-line. Next there are two paths, which can be done now, and one of which will require Homeward Bone usage, or skip and return after second bonfire is opened. You will always start from the ledge outside the house where Mild Mannered Pate and Creighton Of Mirrah fought (zip-line brings you there), this place will be referred to as the starting point. Head left past the zip-line onto the wooden platform and drop down to reach a corpse holding a Large Titanite Shard. You need to drop down again, now onto the platform with the Estus Flask Shard on the corpse. Homeward Bone but now do not take the zip-line. Take the second zip-line head through the doorway to reach a room with 2 Hollow Mages and a Ducal Spider on the ceiling. Take them out then loot the corpse to the left for 4x Lightning Urn. Go through the small doorway ahead to reach a ladder. Climb down to reach a room with a bonfire and a door. To your left, there is another Ducal Spider, so watch out. Head out the door to reach the sand pit. When resting or returning to this bonfire, the Spider that's located on the ceiling in the previous room will jump down to this room. To your right, you'll find a corpse holding a Petrified Dragon Bone, grab it and proceed into the next door. Inside you'll find an old friend if you freed her from the Shaded Woods, Weaponsmith Ornifex. In her room, you'll find jars and bookshelves to the left. Break them to find corpses holding a Flame Butterfly and a Pharros' Lockstone. Head back outside and enter the opening in a wall to your left. Behind the bookshelves ahead is a room with another Spider and a chest containing the Crescent Axe and Soul Vortex. Back in the main room, up the small hill, is a ledge that allows you to drop down to a small room with a corpse holding a Titanite Chunk on the left, and a door to the right (note that once you drop down this ledge, the only way to return to the earlier part of the level is to do an angled jump back to the ledge). Through the door is a large courtyard. Ahead is a Basilisk and a Spider Drone. Kill them and then head through the half broken wooden door ahead. Kill the Ducal Spiders inside then head up the stairs and open the door to find a corpse with a Large Titanite Shard. A scripted Red Phantom will spawn below you, past the archway. Drop down back to courtyard. Ignore the obvious bridge for now and head towards the last closed door in this area. Trying to open it gives you the message "Too heavy to open". Smash that piece of kindling down with ranged attacks or else an un-dodgable sand burst will hit you. Go through the door and open the other door ahead with your Tseldora Den Key you received from either of the scumbags from earlier. Two chests are found in this room. The wooden one to the left is a Trap Chest containing 10x Rusted Coin, and the metal Chest contains the Engraved Gauntlets (upon opening the chest, you'll hear the dialogue between Pate and Creighton, revealing both are miscreants; however it does not occur if you killed both of them). Collect them and head outside. Go through the archway to the bridge. Now head towards the building, and you'll notice two Spider Drones on the second floor of said building. 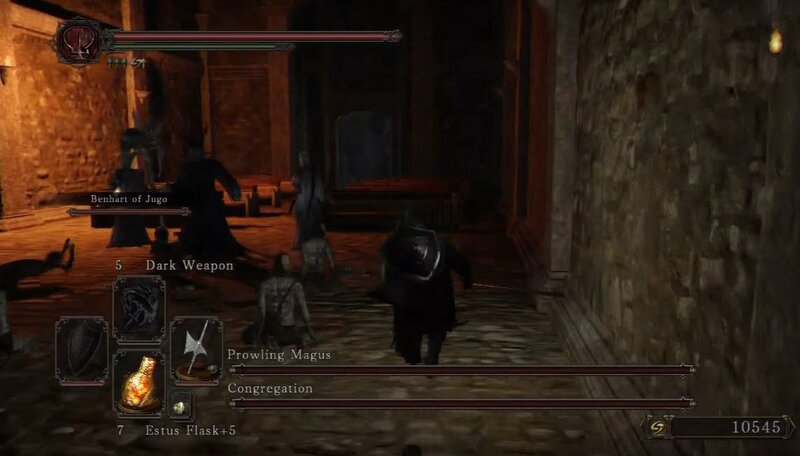 Kill them before you open the door and look up to find multiple Ducal Spiders are on the ceiling, so use ranged attacks or move ahead and let them drop down. To the right is a locked iron door, you need the Brightstone Key obtained after the boss battle to open it. To the right of the door is a bench that can be broken to reveal a corpse with a Soul Of a Hero and 4x Gold Pine Resin. On the far wall are two doors, each with their own lever next to them. The door on the right holds a corpse with Homeward Bone x3. The door on the left holds a Spider Drone and a ladder heading up. Climb it to reach Freja's Lair. In this room, you'll find many spider webs which serve as bridges, which as you step on, will trigger Ducal Spiders to engage you. Drop down from the ledge and move left, hugging the wall. Move down the first web and reach the far side. Behind the first pillar is a corpse holding a Torch. Careful, aa s Spider will drop down near here. Move forward towards the Jars on the far side. In them is a corpse holding Pharros' Lockstone . Move across the web to the left. At the end, drop to the large web to your left and follow it down. Halfway down is a corpse holding Radiant Lifegem. Go down to ground level and kill any spiders that attack. To your left is a small but wide web leading up to a platform above. On the far side, you'll notice a corpse holding a Twilight Herb. Return to the ground level and underneath the large web is a corpse holding a Simpleton's Spice. From here, head to the far right side of the room and behind the last pillar is a corpse holding 5x Corrosive Urn. As you may have noticed by now, there is a large Fog Door ahead; what you may not have noticed however, is the summon sign for Ashen Knight Boyd behind one of the pillars. Defeating her, means you can move towards the dragon and pick up the great soul. Head through the cave to the right to reach the Lords Private Chamber where you will find Duke of Tseldora, back turned to the player while focusing on a table in front of him. Defeat the hollowed Duke to receive the Brightstone Key, a Fragrant Branch Of Yore and the Dark Quartz Ring +1. 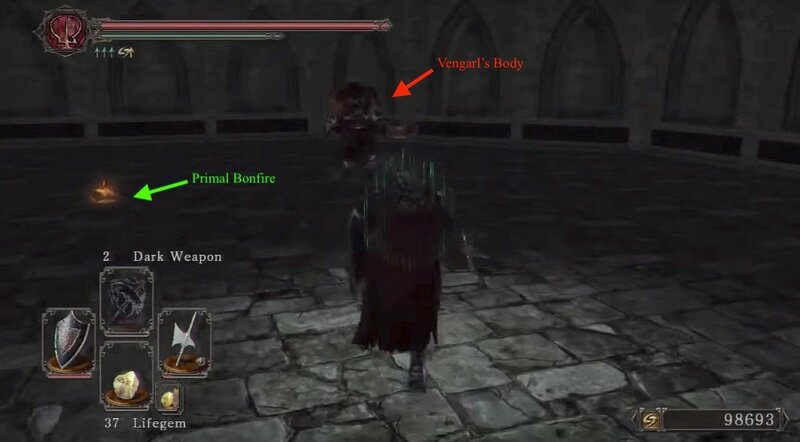 Down the stairs to the right is a Primal Bonfire but be careful as it is guarded by Vengarl's Body; to get his armor, kill him. Now its time to come back to the locked iron door in the first chamber of the building and unlock it with the Brightstone Key you have just acquired. Once inside the room open another door and prepare for another Spider ambush. Kill them and loot the highly-valuable chest in the room for a Black Knight Ultra Greatsword, a Great Fireball, and a Fire Seed. There is no way to backtrack out of this area, so either Homeward Bone out or use the Primal Bonfire to get to Majula. Assuming this was your fourth Old One slain, head on to the Shrine Of Winter. Return when you have the Ashen Mist Heart and activate the crystal within Freja's room to access the Memories of a Dragon.